How many times have you heard a great solo on a CD & wished you could play it exactly like the original? Musician's Workshop caused a minor revolution in 1977 when IT started offering half-speed recorders especially for the purpose of 'figuring out licks off of records.' At that time, only a few people were practicing this valuable secret. 25 years later, we are still helping people to get started learning music 'all by yourself' by listening to your favorite CD & trying to figure out what your hero has played. In this 2-hour video you will learn the history of lick learning, the ear training benefits, & how the process actually works the same for all instrument. You will see a complete & thorough demonstration of all the lick-learning machines as well as how each works & sounds. But most of all, we will show the reason why 'figuring out licks off of records' is absolutely the most important, valuable, & fulfilling way to learn to play a musical instrument, & truly the only way to develop your ear! 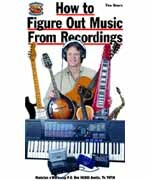 (2-hours) Includes: Matching tones to simple songs, learning easy & difficult licks from hit records, preparing the recording for analysis, tuning up to the recording, figuring out what key it's in, figuring out chords & chord progressions, special problems for fingerpicking, harmonica, bass, drums, figuring out musical ornaments, developing artistry, & much more! Watch Dan actually figure out licks, solos & chords , from several songs, (using several different instruments) as he explains the secrets & the use of the devices. *For all instruments and all styles of music. -------------------------------------------------------------------------------- About Dan Huckabee Dan Huckabee, has a degree in Music from The University of North Texas. He won the National Dobro Championship, & has played with The Allman Brothers, Lyle Lovette, Nancy Griffith, & Robert Earl Keen Jr, just to name a few. Dan founded Musician's Worskhop in 1973, teaches Guitar, Dobro, Mandolin, & Harmony Singing at The University of Texas Informal Classes, has taught workshops & seminars at festivals all over the United States, & has authored over 250 music instructional products. So get comfortable & let Dan's lifetime of musical experience guide you through everything you need to know in the quickest & easiest way possible!